The work-camp within the project «Image Mapping in Kholodnyi Yar» is successfully completed! 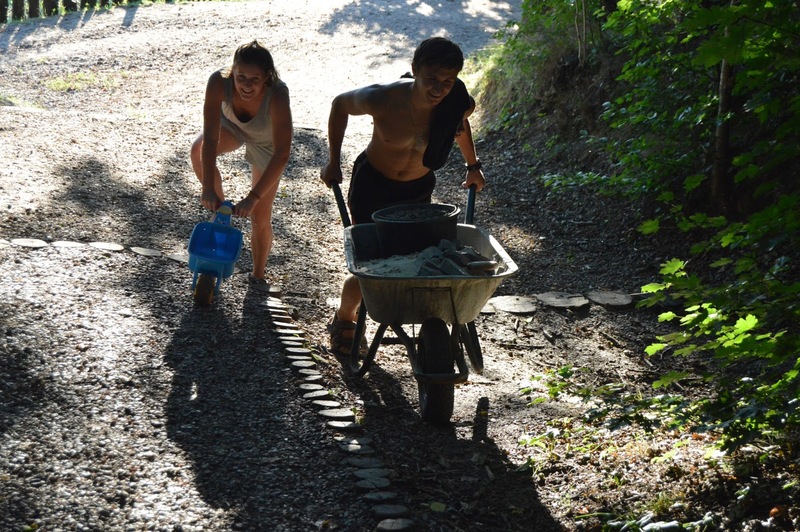 Volunteers and participants of the camp had left to keep enjoying the summer, to travel or to work. It was a great and at the same time responsible time together, which allowed to achieve the goals and left behind nine new points on the map of creative touristic routes “Alive pictures”. After The Busha 2015 the NGO “Development Center Pangeya Ultima” gained great experience in the implementation of work-camps within the project concept «Image Mapping». But this time organizators faced a greater challenge, because they had to deal not with one, but with 5 villages that belong to the historically significant for Ukraine territory called «Kholodnyi Yar». The aims of the camp, according to the concept of the project «Image Mapping» remained unchanged: the construction of the route of «Alive pictures», establishing the intercultural dialogue, activation of local people and studying the ethnographic and natural wealth of villages. 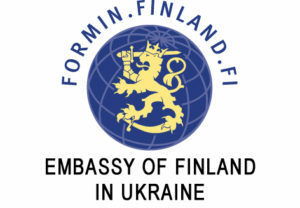 The partners of this project are: the Embassy of Finland in Ukraine, the program of the European Commission “Erasmus Plus”, the Ukrainian crowd-funding platform «Spilnokosht», Service Civil International network and the NGO “SVIT-Ukraine” from Kharkiv, the “Kholodnyi Yar” branch of the National Historical and Cultural Reservation “Chyhyryn”, the NGO “Kholodnyi Yar-Ukraine”, the Medvedivka village council (Chyhyryn district, Cherkasy region) and the NGO “Medvedivka”, the NGO “Tourist movement of Chyhyrynshchyna” and the restaurant and hotel complex “Dykyi Hutir”, the Melnyky village council and the Melnyky village fund (Chyhyryn district, Cherkasy region), educational and entertainment complex “Zernoland”, the private entrepreneur Ohota Vitaliy (Cherkasy), the civil movement “For the prosperity of Cherkasy region”, the NGO “Nashe Podillia” (Vinnytsia). The participants of the camp were about fifteen young people from Ukraine, Poland, USA and France. They lived in tents in Medvedivka on the territory of the museum of local lore, all together they organized camp life, cooked meals, talked along starlit summer evenings near the campfire. There were also small participants – Liosha, Myroslav and Mark, who came to help their mothers. Also the participants of the camp organized very important intercultural meetings in each of the villages. 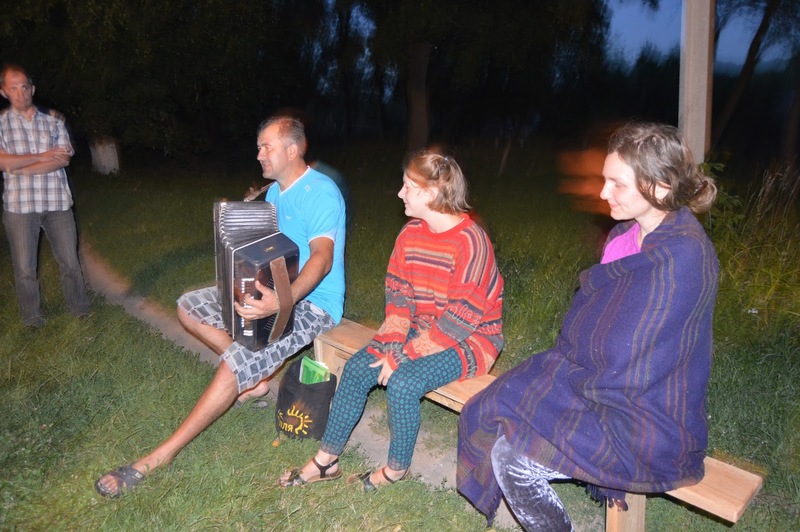 One of the partners in Ivkivtsi village even said that the locals didn’t have such meetings for more than thirty years, because the local culture club is closed and people don’t have the chance to meet together with cultural exchange aim. Foreign participants has created the special atmosphere, they talked about lives in their countries. The participants of the camp also prepeared different entertainments for younger visitors of intercultural meetings. As well the videos were shot and some photos taken for the bank of audio-visual materials that explore cultural and natural wealth of the region. These materials will be published on the website of the project www.imagemapping.org. Also this project, as planned, through its activities and its route has performed an important function – unifying of different villages and influential people. Some may have different ambitions, but it’s a fact that all of them have a strong common desire – to develop their native land, village and homeland in general. 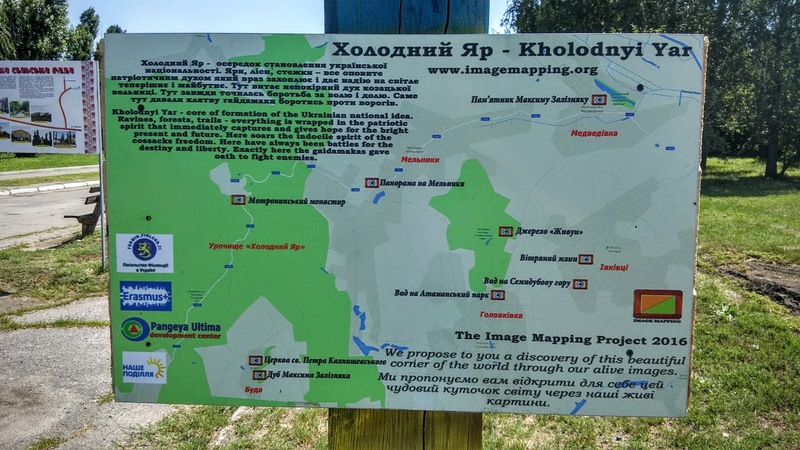 We hope that our project “Image Mapping” will shed more light on interesting historical and natural places of “Kholodnyi Yar”, attract the visitors (including tourists from abroad) and stimulate the development of the region more and more. We are thankful for all who helped and who stayed with us. “Image Mapping” to be continued! 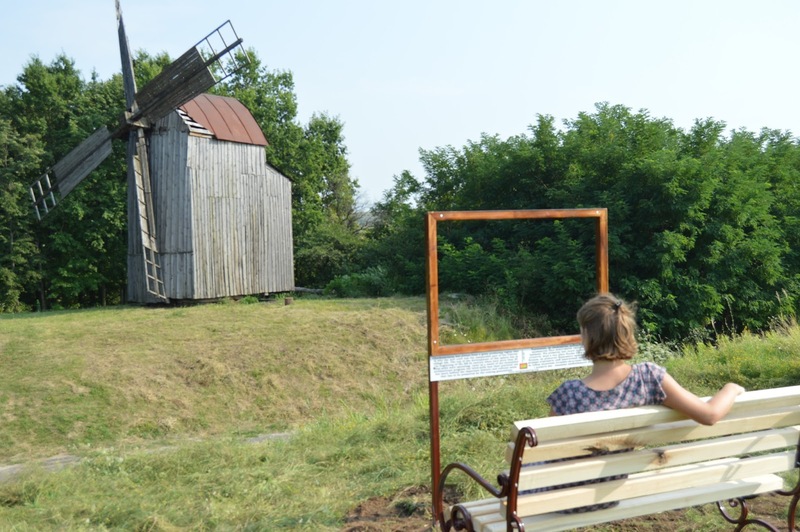 Opening secrets of the “Kholodnyi Yar” through the «Image Mapping 2016» project. 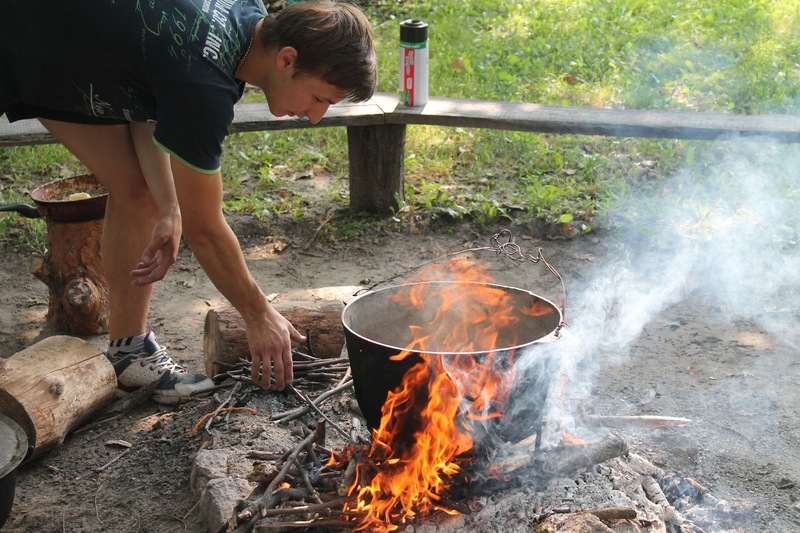 International Work-Camp took place in the “Kholodnyi Yar” (Cherkasy region) and was continuing from 26 of July till 8 of August. 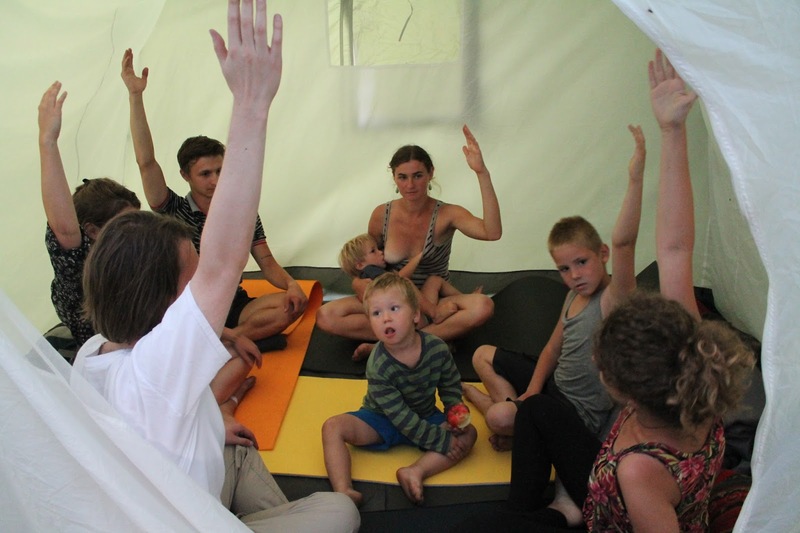 There were around 15 participants from Ukraine, Poland, France and the USA including 3 children from 2 years and older. Working language – English, cooking, sleeping, communicating – under the open sky. There were installed 9 points of “Alive pictures” and also were involved 5 villages to the project. We where hospitably accepted by the Museum of local lore and we are really thankful to Bohdan Lehoniak for this. The territory of museum was equipped with the place for bonfire, tables, showers, toilets, even the attic which we used. 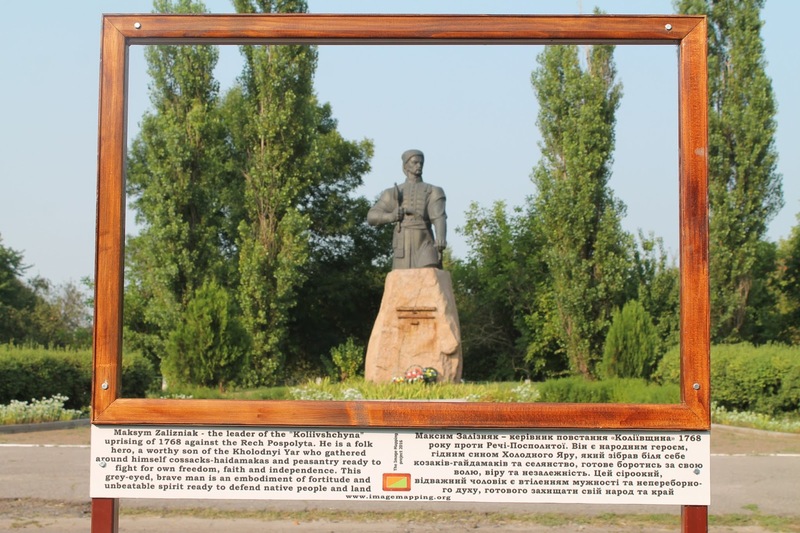 There is a might monument of Maksym Zaliznyak in Medvedivka, who is pondering and watching what is happening in “Kholodnyi Yar” nowadays. And in order to make it better and more interesting to see the monument, we have established one of the nine points of “Alive pictures” to focus the attention on this historical giant. It seems that Maksym Zaliznyak is alive now, when you look at the picture, and you can say hello to him and have a talk about times of rebellions in the “Kholodnyi Yar”. Then we traveled further in Ivkivtsi village, the birthplace of Maksym Zaliznyak. The village is small, only 200 people officially live there, practically it’s even less. But people here are really friendly, especially Nazar Lavrinenko, the owner of ethnographic complex “Zernoland”, who helped to renew an old mill and promote the Semydubova mountain. The process of installation of benches and “Alive pictures” took not much time, because we worked in the great company. Some people dug the pits, others – mixed the cement, took the pictures, the kid’s laughter cheered everyone up. The mill literally became alive, because we have turned it by front straight to make it look good inside the picture. Creaking, squeaking but now waiting for an audience. Then the whole company went to the Semydubova mountain. According to the legend inside of this mountain lies the body of Bohdan Khmelnitsky. And who knows, maybe that’s truth. So now there is the third point of “Alive pictures” where you can sit on a bench and think whether this great hetman was buried there or not in the same time enjoying the incredibly beautiful landscapes. In the evening, many people came for the intercultural meeting, usually it’s called as a “concert”. As Nazar Petrovych said: “Over the last 30 years, it was the first time when the villagers gathered in the same place. On “the concert” people learned more about the culture, customs and language of other countries, sang songs, children played games… So one more busy day has finished. Then the work was in full swing in three villages – Holovkivka, Melnyky and Buda. We installed two points in Holovkivka – one near the Otamanskyi park and other near the “Jyvun” well. We received help from the local activists (special thanks to Oleksander Ovdiy and teacher of history from the local school – Yevhen). 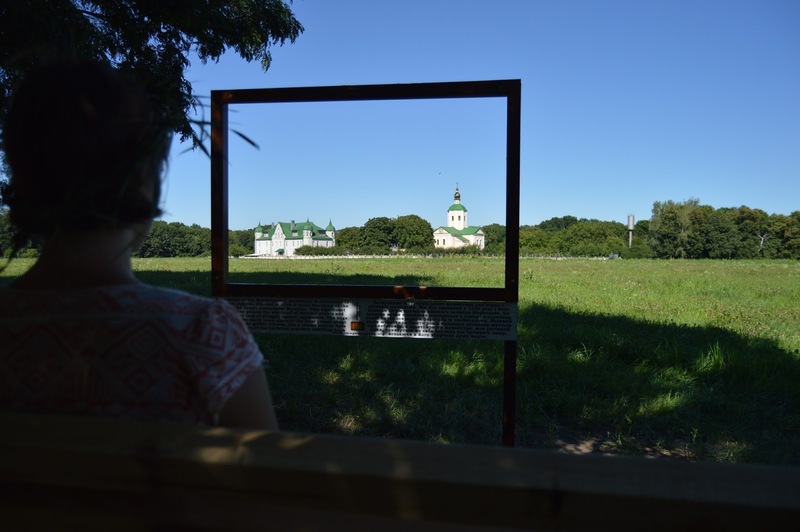 In the Melnyky we made alive the Motrynskyy monastery and enlivened views of the picturesque landscapes of the village its cliffs of the “Kholodnyi Yar”. 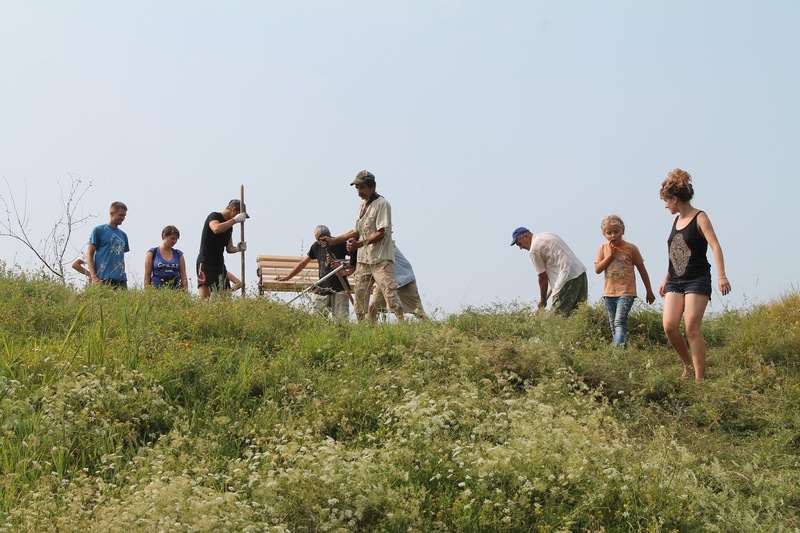 The Melnyky village council (Chairman Volodymyr Sergiyovych), NGO “Kholodnyi Yar – Ukraine” (Zinchenko Leonid, Romancha Yurij) and active locals joined us and helped a lot. 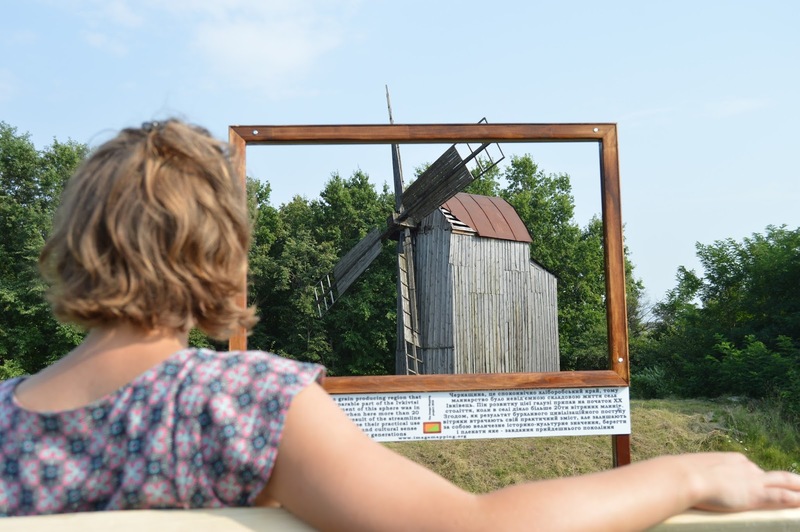 Now the inhabitants and tourists will watch the beautiful view of their own village through “Alive pictures”. 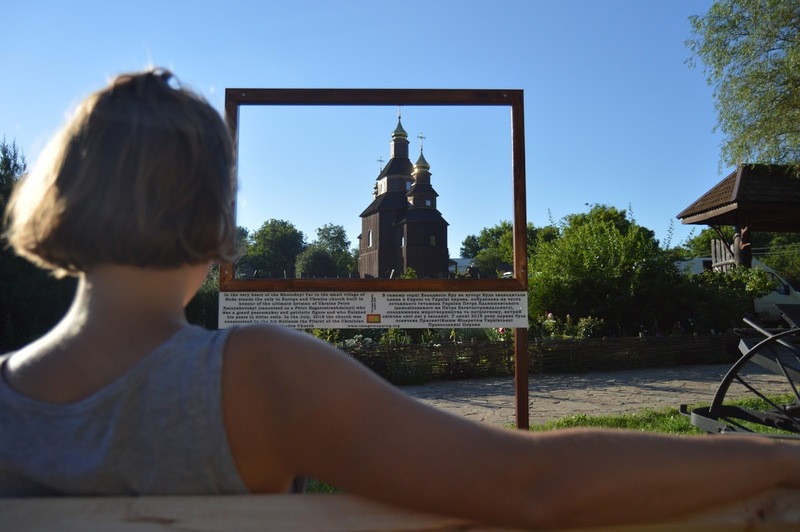 In the Buda, in the center of “Kholodnyi Yar”, we installed “Alive pictures” with the view on the church dedicated to the last Hetman of Zaporizhska Sich Petro Kalnyshevskyi and with the view on the old millennial oak called after Maksym Zalizniak. Now the Oak friendly waves with its branches in the frame of the “Alive picture”, like he shows off by his great age. Also it was Lesia Ostrovska – the owner of the complex “Dykyi Hutir”, the president of the NGO “Touristic movement of Chyhyrynshchyna”, the great patriot of her homeland, whose help was very felt in Buda stage. 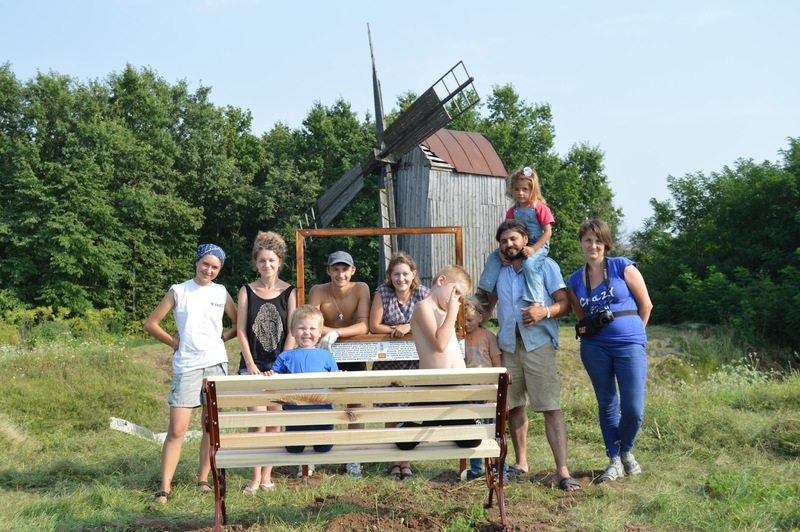 Also in Buda we had the opportunity to contribute to the building of ecological homestead of Oleksiy and Tetiana Yurchenko. We mixed the clay and straw by feet, erected the wall of cozy hut, tasted green cocktails made by Tetiana and in general had a good time. 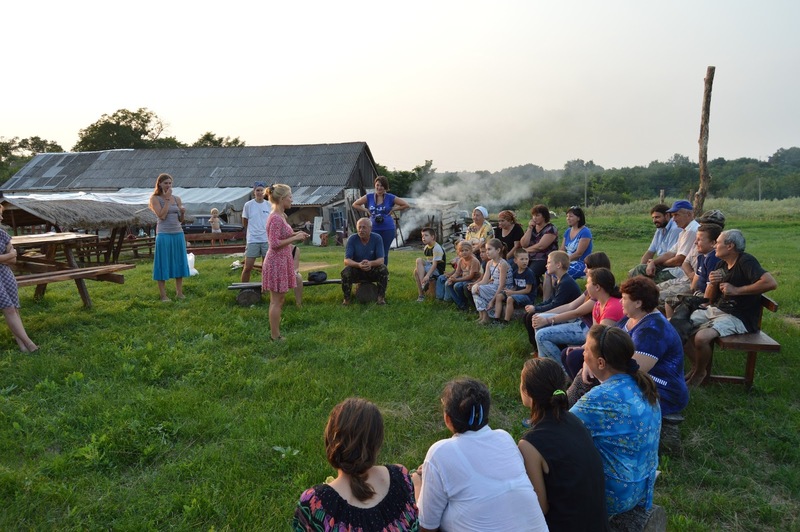 Also, in every village we had intercultural meeting, where we communicated with the villagers, talked about the future of Ukraine and the fame of “Kholodnyi Yar”. The camp has ended, someone went home, others went to their countries. Only the “Kholodnyi Yar” is always waiting for new adventures. Many legends are hiding inside of these forests, a lot of secrets, interesting people and events. Who knows what will happen next. But the fact is that it’s necessary to know, appreciate and spread the glory of our liberators, cherish our native culture and don’t forget the importance of “Kholodnyi Yar” in the formation of modern Ukraine.